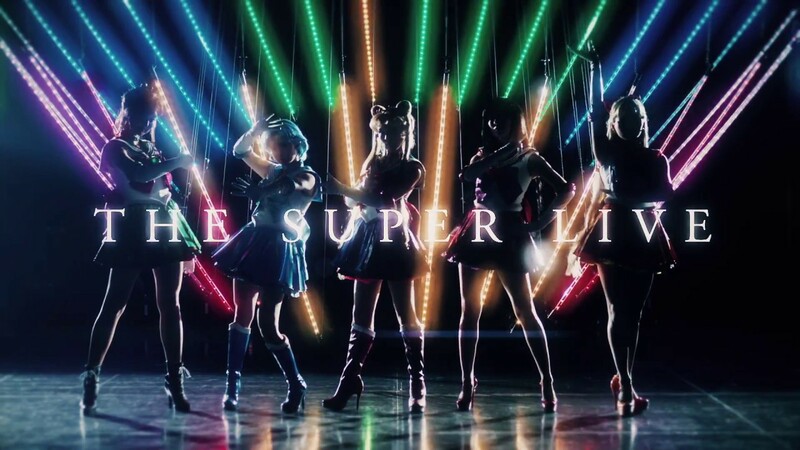 Back in December, I was able to get a ticket for Christmas to the Sailor Moon Super Live–I didn’t think I’d be able to make it, as I was transitioning into a new job, and went from working nearly full-time, down to part-time. I also was in the middle of my first semester of grad school, which came with its own trials and tribulations. However, I was given the funds during Christmas to attend the show. The show was almost sold out when I managed to get a ticket. I had seats towards the back, but I felt so grateful for this gift, and the rare chance to see the actresses portray the characters in person! For many events from Japan catered to anime fans, shows are streamed on a movie theater screen, meaning the cast is not shown live. This event is a great example of the popularity of events such as this in the anime community. So, I got super lucky, a day before the event: I was able to get a bit closer to the stage, and got an orchestra seat. People who sit in the orchestra are VIPs and get added perks, including early admission ( which also means early access to merchandise), a free bonus item, as well as brief interactions with the main cast after the show! I woke up early in the morning, maybe around 7 a.m.. I woke up at this time because Book Off opens up in NYC at 10a.m., and I was selling books to get some extra cash for the show. With fifteen extra bucks in my pocket (hey, it’s something), and a quick trip to a cafe later, I made it to the VIP line, with plenty of time to spare! I was one of the first folks in line. People in line were excited about the show and many people wore official shirts and jackets in order to show their love for the series. I saw about a dozen cosplayers or so, plus there were people who decided to wear casual cosplays. I had mixed opinions on staff who worked in the PlayStation Theater. I am not much of a theater person, and do not typically understand the expectations of theater etiquette. I have had poor experiences in the past from staff who works at theaters, so I was a bit nervous to interact with staff. They did talk to us a bit like children sometimes, occasionally giving us orders such as telling us to keep on walking or moving. I didn’t have horrible experiences with staff, but they did make me feel a little frustrated sometimes, such as the instance when I showed my ticket inside and was let in to the main building. I went to go find my seat in the audotorium, and a guard talked down to me, gave me a dirty look, and I was told to go to the side before entering and show my ticket again before being allowed inside. He didn’t say why or explain, but I learned that I could show my ticket so an staff member can show me to my seat. I wish this could’ve been explained to me, but at least I learned one of the interesting parts of theater etiquette. I don’t frequent theater shows, so I did learn many social cues as the show went on. There was also another staff member who went around to people at least an hour before the show, telling them repeatedly to put away their phones even when they were texting. This was also a bit frustrating, as I did want to make a phone call before the show started, and send out a few texts to family members. I am also am unsure if this is something that is part of theater etiquette, or something normal to expect from attending a Broadway show. 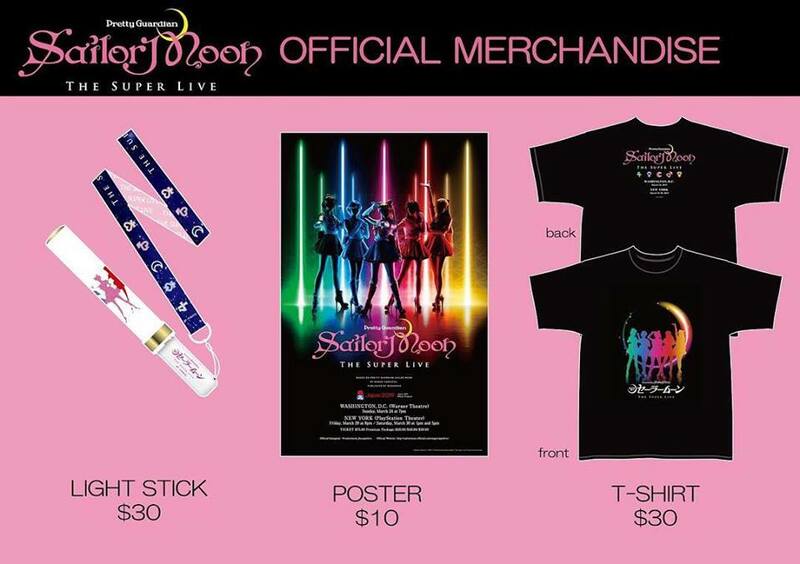 Gripes on staff aside, I am going to give a mini review below about the merchandise which was sold during the show.,with a focus on the Super Live items. Though I do want to note that there were other items sold such as manga, and an item or two from the official Sailor Moon Store. Lightstick: The lightstick looks stunning. It has silhouettes of the main cast, plus small details such as Usagi’s locket on the top. The lanyard that comes with it is also very pretty, with symbols of the inner senshi. However, I did want there to be an adjustable part of the lanyard, to change the size based on your wrist. I did have to twist it a bit around my wrist to use it during the show. Poster: The poster is a great size and has a gorgeous image of the main cast with their main colors. I love this poster, and the show was memorable enough for me to frame. As I write this post, the poster is above my desk. I wish I had the opportunity for the cast to sign it! Shirt: I do go on about the shirt for a bit, but hear me out. The shirt is…okay. I did appreciate that they did have unisex medium and large American sizes. The shirt is made out of thick material, but it is a very basic gildan brand shirt, and the image quality isn’t too great.. When I purchased it, I saw a bit of grain in the image up close. On the other hand, the shirt is exclusive to both the Washington D.C. and NYC showing, and does have dates. I may recommend having this shirt to frame if you’re an avid fan, but I personally am not the biggest fan of the quality. In short, I loved this show. It was a great experience. But of course, I will go in detail about what I recall. One of the biggest aspects of this show was the interesting display they had, that was timed with the movements of the cast. To explain further, there was a semi-transparent screen across the stage–the screen worked by showing images and projections. The main cast was in front of the screen, and projections right from the manga, complete speech bubbles appeared behind them during more comedic moments. When there were battles, viewers saw projections of the characters powers, from Sailor Mars’ fire ability, to Jupiter’s thunder. We were also treated to beautiful images from the manga of each of the main characters at the beginning. The scene at the arcade was both funny and entertaining. In this scene, Mamoru was rather blunt to Usagi, telling her she was terrible at the games. At one point, Mamoru an Usagi gets trapped in the video game, courtesy of Kunzite, one of the main villains. This was an interesting concept. I also believe that Kunzite’s rather poor disguise poked fun at some anime series, where characters are oblivious to villains who wear very paper-thin disguises. I believe the song the actresses sang during this part was called ‘Best Friends.’ Although the concept of this may seem a little cheesy on paper, it played out super well. One of my favorite parts of the many adaptions of Sailor Moon is how Usagi has her flaws, but also her strengths. Usagi has the ability to bring out the best in others. Although Usagi is a bit clumsy and a crybaby, she is not judgmental and is able to see other’s own strengths. There is a tragedy at one point of the musical and Sailor Moon struggles and feels alone. The other inner senshi come in during this moment, giving Sailor Moon courage. The lyrics of the song were very fitting with the moment. Confetti fell towards the end of the show, each with the colors of the inner senshi. Although I was towards the back of the orchestra and confetti didn’t really fall much in my row, it was amazing sight. When Usagi was running late for school during the beginning of the show, she ran through the middle aisles and onto the stage, and glitter fell down as she ran There were a few moments where the cast went in the vicinity of the audience. There were a couple of nods to the location of the show. The most memorable one for me was from the books some of the cast opened during a dance sequence, which spelled U.S.A. I was able to interact with the actresses, and had a great interaction with Sailor Venus. She was really happy I liked the show during the handshake event, and had so much energy! I had an amazing time at this show, and really hope that there will be future Sailor Moon Musicals in America in the future. The tickets were sold out for my showing and I heard that t-shirts sold out in a D.C. showing. At the end of the 1p.m. show, the penlights were sold out. I want to mention the excellent sales of this event because it is clear there is a demand for more events such as this. Although nothing is confirmed at this point, I am hoping that there will be other musicals which cover the other arcs of this series. « Episode 401 : Warmth in Your Pocket.